Block 162 is a proposed affordable housing development located within Portland’s Historic Alphabet District. The district’s renowned walkability, access to transit, and elevated land costs make this a rare and high opportunity site. An existing but unoccupied historic structure located on site will be rehabilitated, seismically upgraded, and adaptively reused. In addition, two new buildings will be constructed, forming a three-building, half-block development with levels of affordability ranging from extremely low-income seniors to 60% average median income workforce housing. The design of three distinctly unique buildings serves to break down the massing and better relate to the fine-grained pattern of development in the surrounding context. All buildings have their main entrances fronting a commercial street. This, combined with locating public use spaces along the same street frontage, will activate the streetscape and enrich the pedestrian experience. 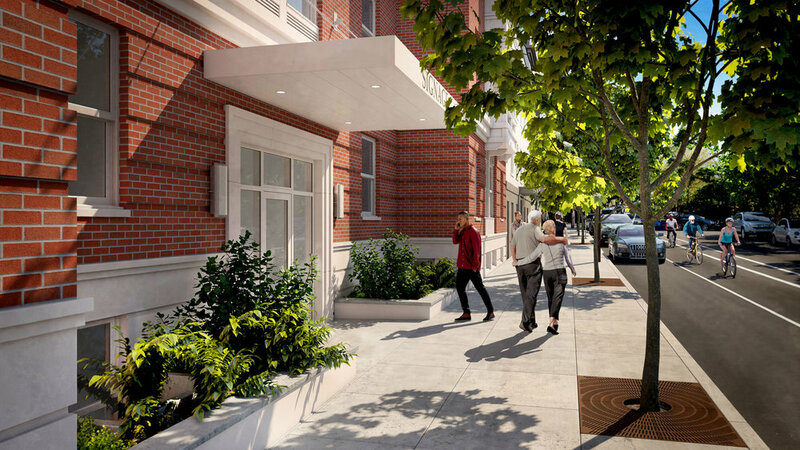 In response to the smaller-scale residential side streets, the buildings are pulled back from the sidewalk, allowing for a landscape buffer zone. Durability and sense of permanence will be achieved through use of quality materials installed with a high level of craftsmanship. The result will be a development that brings much-needed affordable housing to a desirable location in a way that visually aligns with the surrounding context and provides opportunity to those who otherwise would face barriers to living in this neighborhood.